The day is not just about Janhvi Kapoor and Ishaan Khatter's Dhadak but also about Diljit Dosanjh and Taapsee Pannu's Soorma, the trailer of which has taken the top spot on the trends list. Diljit Dosanjh's portrayal of hockey legend Sandeep Singh is marvelous and Taapsee Pannu too leaves a definitive mark on the audience's mind. Soorma maps Sandeep Singh's journey to become India's top hockey player, his downfall after the gunshot which left his paralysed waist-down and his subsequent phoenix-like rise from the ashes to reclaim his position of India's No 1 hockey player. Diljit Dosanjh picks up Sandeep Singh's character to the T and is fabulously supported by actors like Vijay Raaz and Angad Bedi. 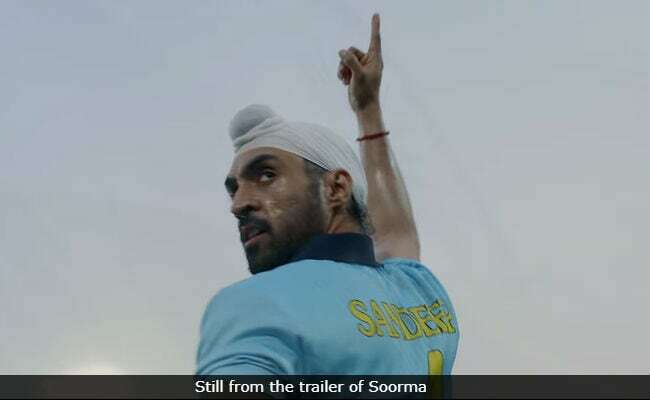 Soorma, which is directed by Shaad Ali, is the story of hockey player Sandeep Singh, who was paralysed after he was shot in the back while he was en route to join the national team headed for the Hockey World Cup in 2006, when he was at the peak of his career. Sandeep Singh did not let a wheelchair come between himself and his passion for the game. After striving for two years, Sandeep Singh returned to the game and re-established himself. Diljit Dosanjh earlier told news agency PTI that he knew about Sandeep Singh's illustrious career as the captain of the Indian hockey team but he did not know about the accident, which almost ended his career. "What I didn't know was, how a man who was shot, stood up, recovered and made a world record. It was shameful, but we didn't know," he said. Soorma releases on July 13.